I'm loving iridescent colours lately as you may be able to tell. I also love black acid wash denim and in the form of dungarees/pini's I think it is so nice. I Need a Topshop fluffy jumper, I think this is no. 1 on my wish list. I like this pink one but don't know whether I should get one in black because it would be more practical, in that it would go with more. Love your wishlist and blog, especially the pink sweater! great selection!followed you on gfc! follow me back? 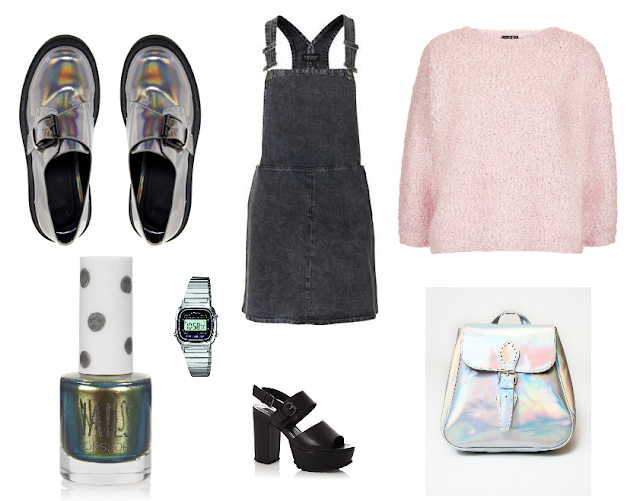 Love this wishlist and all the holographic items! Love the jumper and hologram back! Love your blog, new follower! Love it, especially the pink sweater!! Love the luxe shine backpack!!! Need this on my blog.